The cast of Binnelanders gathered for a glitzy photo shoot recently, to snap new pics of the long-time cast and to capture the show's newcomers. 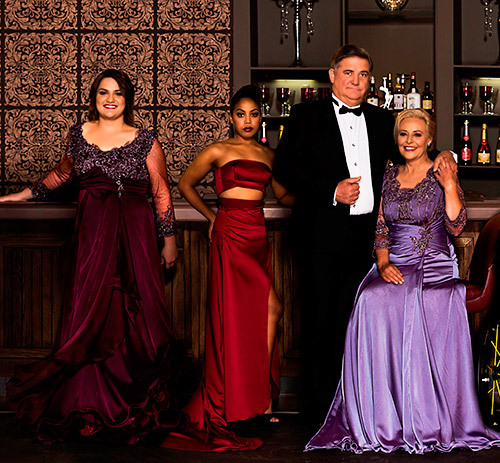 Je-ani Swiegelaar (Naomi Ferreira), Zeena Edwards (Adelyn Jacobs), Ben Kruger (Okkie Ferreira) and Hannelie Warren (Ilse Ferreira). Erik Holm (Rian Malherbe), Nadia Valvekens (Pippa Malherbe), Retief van der Liefde (Christiaan du Preez), Reynardt Hugo (Tertius Jonker), Desiré Gardner (Daleen Jonker), Stefan Ludik (Gustav Kemp) and Pascal Pienaar (Karli du Preez). David Konrad (Herman du Preez), Brumilda van Rensburg (Jana du Preez), Hans Strydom (At Koster), Leandie du Randt (Ivanka Gouws), Kim Cloete (Bronwyn Abrahams), Clint Brink (Steve Abrahams) and Sandi Schultz (Jennifer Adams). The outfits were designed by various up-and-coming designers and everyone's hair and make-up was done by the Binnelanders make-up team. The eye behind the lens: photographer Vernondo Boshoff.